I have been waiting for Environ to introduce the ‘home facial’ for a number of years, and this is the closest we’re going to get for the moment, and I absolutely love it. I can hear you shouting, “But what does it do Sarah?”. Let me explain. This neatly packaged device stimulates the skin to allow for significantly higher concentrations of active ingredients to be delivered to the key areas of concern. Are you following so far? The benefits to you, the Client, is that you are going to get much faster results by increasing skin health from your homecare programme than manual application alone. Being the impatient person that I am, I don’t want to be waiting too long to see skin changes, particularly as I’m approaching 50. Take 10 years off me now but without injecting me or cutting me please. What I really love about this is that it doesn’t take any time out of my day really. It is so easy to use that I can relax in front of the TV after cleansing my face and then apply the serum I wish to use (at the moment I am loving the Avance Elixir) to my area of concern. For me this is my neck. I turn it on and I can sit and watch Eastenders (that’s my secret out) whilst giving my skin some much needed attention. It takes 15 minutes to treat my neck. We are going to be doing a video blog in the next couple of weeks so that we can actually show you how it works in action. Has my neck improved from using the device? Yes, it has, the elasticity is starting to restore and the pigmentation from sun damage is noticeably faded. Having used Environ as my skincare product for 15 years now, I have seen an even more dramatic improvement since introducing this device into my regime. So can I stop having facials now? No, it’s not recommended as the machine we use in the salon is going to provide your skin with even more dramatic transformations. It’s a little like going to the gym, it’s always best to workout at home as well as the gym to get the best results. Tri-Peptide Avance Elixir – for lines ,wrinkles and pigmentation. Peptide Enriched Frown Serum – aids with reduction of frown lines. Concentrated Retinol Serums (1 – 3) – aids pigmentation, sun damage and textural problems. HA Intensive Hydrating Serum – this will help with dehydration and pluming of the skin. Vita-Enriched Colostrum Gel – for soothing, calming and strengthening of the skin. Body Profile – to assist in the reduction of the appearance of a double-chin. 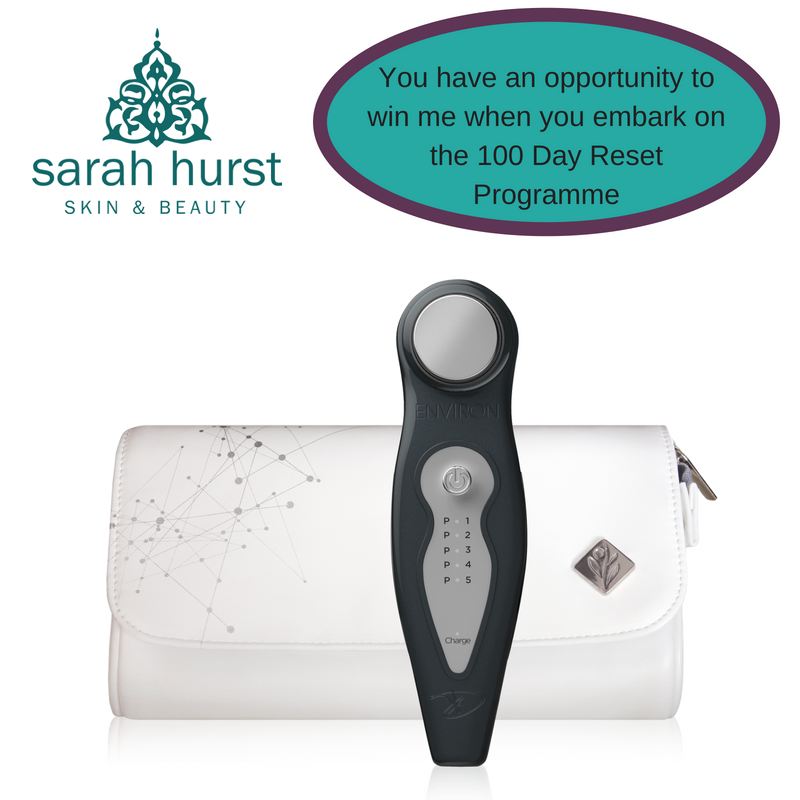 For all those clients embarking on the 100 Day Reset Programme with us before 23rd July will have the opportunity to be entered into a competition with the Institute of Anti-Ageing to win an Environ Electro-Sonic DF Mobile Device, plus a serum of your choice. If you would like to find out more about the device or the programme, or just to find out what we can do to assist with your skin transformations, then please book in for a skin analysis. We are currently offering this free of charge. Call us on 01273 270709 or email us at sarah@sarahhurst.co.uk and we would love to help you.